I read the article below in the UFT newspaper, NY Teacher. Congratulations toRobert D'Alessio and Jessica Romano for helping Carmen Alvarez remain in the UFT PR + pool. How many times have I heard about a teacher asking to see the IEPs of his/her students, then getting charged with discontinuance or 3020-a? How many times have I heard that Carmen Alvarez, or Emma Camacho-Mendez, have never responded to a request for help with special needs' class sizes or non-compliance with IDEA? Too many times. What the real stats are is anyone's guess, but I would like anyone who has tried to contact Carmen Alvarez and/or Emma Camacho-Mendez for any help to contact me at advocatz77@gmail.com. All conversations will be confidential, as well as any emails (send to me via your private email address, not DOE). Nevertheless, I must go with my current opinion about what happened here as cited in the article below as "sounds good, but there must be more to this story" and I reserve my right to say, the information may be misleading. 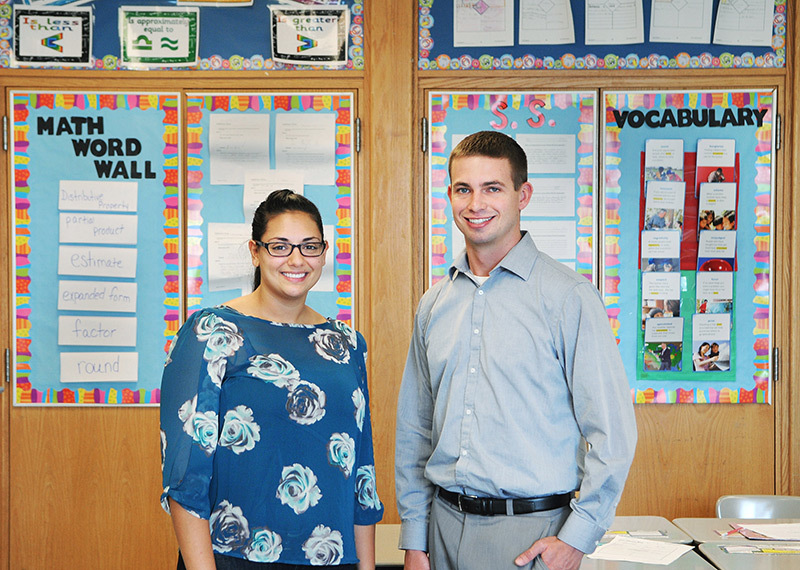 Jonathan FickiesSpecial education teacher Jessica Romano and general education teacher Robert D’Alessio in their Integrated Co-Teaching classroom at the Abraham Lincoln School in Brooklyn. Robert D’Alessio knew within the first couple of days of school that the composition of his new 4th-grade class was off. Too many kids in his Integrated Co-Teaching class were struggling, said D’Alessio, the co-teacher for general education in the class at the Abraham Lincoln School in Cypress Hills, Brooklyn. Too few students were high-achieving enough to serve as models for the others. Integrated Co-Teaching classes are supposed to have a limited number of struggling students so that those with disabilities get the attention that they need. D’Alessio knew this and that in this first year of the new teacher evaluation system, the evaluations for him and his co-teacher for special education, Jessica Romano, would depend in part on demonstrating student growth through assessments. So, D’Alessio did research that confirmed his hunch: 17 of the 27 children in the class — 63 percent — had Individualized Education Programs (IEPs). The rules are that classes with a mix of special and general education students should have no more than 40 percent, or a maximum of 12, students with IEPs. Another question nagged at D’Alessio. Twelve of the students with IEPs were designated to receive only pullout or support services. Did these 12 count toward the legal maximum? He found his answer on the UFT website: yes. D’Alessio contacted his chapter leader, Christina Martin, who put him in touch with Carmen Alvarez, the UFT vice president for special education. D’Alessio drafted an email to his principal and assistant principal, who responded promptly by transferring some of the students with IEPs to other classes and bringing in other higher-performing students. D’Alessio’s co-teacher, Romano, is also grateful for his advocacy. A first-year teacher, Romano said she wouldn’t have known the class composition was so out of whack without D’Alessio doing the legwork. Alvarez said D’Alessio showed how teachers can advocate for themselves to help create the conditions where the greatest amount of student learning can occur.